The first installment of the second reboot of the Planet of the Apes movie series proved to be a decent movie. Then word came that a sequel was being made that would have none of the same characters, save for some of the CGI apes. That didn’t appear to be a formula for success. But word of mouth on DAWN OF THE PLANET OF THE APES was good, and this was a nice movie by all accounts. I finally got around to seeing it so I could decide for myself. I watched DAWN OF THE PLANET OF THE APES (2014) on 6.18.15. It was my first viewing of the film. The first scene in DAWN OF THE PLANET OF THE APES (which, heretofore, shall be referred to as DOT POT A) is very weak. We are reintroduced to apes created via motion capture, including their leader Caesar Andy Serkis), the defiant but loyal Koba (Toby Kebbell), and Caesar’s son Blue Eyes (Nick Thurston). The animals chase some deer and are then attacked by a bear. Blue Eyes is scarred (which notably helps him to be identified throughout the rest of the movie) and the apes communicate through sign language which we get as subtitles. All of that should be fine, but the CGI is downright awful. It looks, honestly, like it was an afterthought added after the rest of the movie was finished. DOT POT A is not a beacon of CGI prowess from their on out, but the graphics at least improve greatly. After that scene mercifully ends, thought, the movie settles down into something nice. We meet the human foils to the apes. The San Francisco colony is led by Dreyfus (Gary Oldman) who has tasked Malcolm (Jason Clarke) with getting a nearby dam working to power the colony. The problem, naturally, is that the apes have taken over the land between San Fran and their power source. 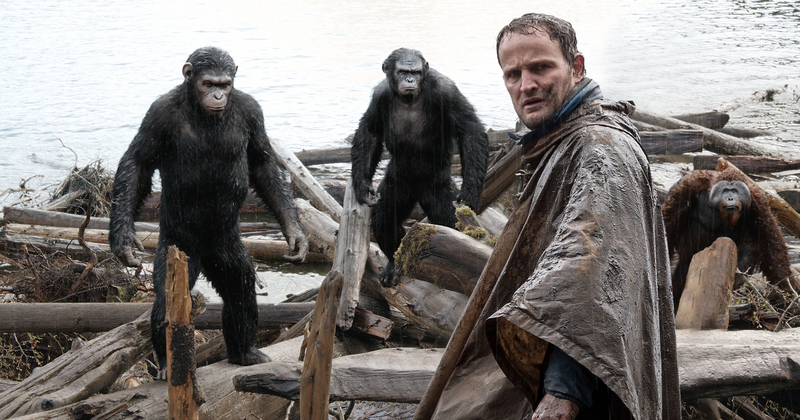 Caesar and Malcolm work to avoid war once we learn that the apes have learned to speak English. There is a nice backdrop of both sides preparing for war as Caesar and Malcolm work together tenuously. This movie fills its run time with parallels between the two species. Both have a powerful high ranking individual determined to fight rather than make peace. Both feature a family, Caesar’s and Malcolm’s respectively, with mild son issues and (admittedly different) problems with the female leader of the clan. The dependance on weapons becomes a common theme for both sides, where guns initially represent power but later come to represent the wedge that drives these two groups apart. The action pieces in the movie are solidly put together, varied, and exciting. Less strong is the patriarchal nature of the world. Keri Russell is brought in to be a female presence and is an important member of the plot-driving team. But she is also given criminally little to do emotively. The men (and male apes) do a nice job of delivering their characters, but it is hard not to notice how far to the backseat the women are all relegated. Still, it shouldn’t be discounted that this is a movie which elicited more emotion than a movie of its genre usually would. Oldman has a particularly moving scene when he gets his iPad up and running. Clarke and Serkis make you believe in their relationship. The effort is there in the performances, more so than we might expect from the eighth movie in the franchise’s history. I liked DOT POT A. I would say that it deserves to be in the action/sci-fi rotation for sure, even if it isn’t a classic of the genre. Really morbid, but in a world like this, it works. Nice review John.